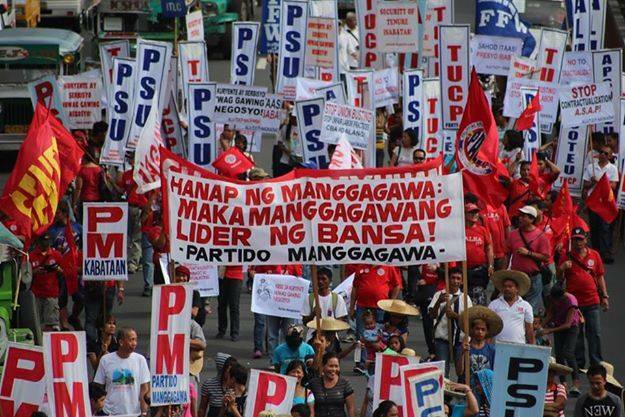 Nationwide rallies by labor groups on Bonifacio Day raised the twin workers issues of living wages and regular jobs. 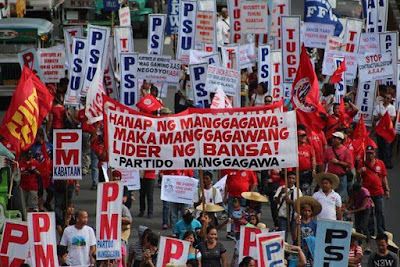 With the elections looming, the partylist group Partido Manggagawa (PM) challenged presidential candidates to heed the workers clamor. Members of PM ripped copies of temporary employment contracts and pay slips with withholding taxes in a symbolic reenactment of Bonifacio’s tearing of the hated cedula that started the Katipunan’s revolution against Spanish colonial rule. “We condemn the epidemic of contractualization perpetrated by capitalists to demolish labor standards and lambast the government for killing the proposed tax cuts that would have raised the take home pay of workers,” Magtubo argued. PM joined other workers groups in the Nagkaisa labor coalition in a several thousand-strong march from UST Espana to Mendiola. Mobilizations in cities like Cebu, Bacolod, Tacloban, Davao and General Santos picketed ticketing offices of Philippines Airlines in a show of solidarity for 117 employees who were victims of a recent mass layoff. The union Philippine Airlines Employees Association (PALEA) has a pending notice of strike over the latest retrenchment. With the Paris COP21 talks on climate change about to start, the Bonifacio Day appeals by workers also included calls for climate justice, climate jobs and just transition. “Labor’s demand for decent work is integral to adaptation and mitigation as people with regular employment and social insurance are better prepared to face recurring disasters,” Magtubo elaborated. PM vowed to continue solidarity actions for the embattled Korean labor movement even as the group criticized Korean companies in the country for union busting and unfair treatment of workers. The partylist group cited the labor disputes at Tae Sung and KEPCO Cebu and also the deaths of dozens of workers at the giant Hanjin shipyard in Subic to buttress its point.